It's time for me to be cooking dinner for the herd. So I'm blogging! Procrastinator? Not me! Oh. Wait. That's Monday. 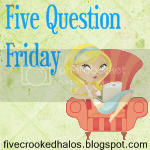 Mama M's Five Question Friday! So here are the rules! Copy and paste the following questions to your blog, answer them, grab the MckLinky code and Link Up! And of course, link on back over to Mama M's, seeing as this is her little carnival! Don't have a blog? Well, shoot, those are free, and even I could .. do.... it. To much? At least for today? Ok, well then answer in the comments below. Or even better, over there at Mama M's so she knows you're playing too! Oh, I LOVE Thanksgiving. Because there is so much that is good to eat! I am an eater. Mama M and her friend Keely are doing this great motivational make sense of what you eat and be sure to work out and look smokin' for the holiday season. I have a diet season, it's also known as tax season, and I usually lose about 15 pounds over that 3 and a half months, so I use the holidays to fatten up in anticipation. So I eat EVERYTHING! I am a huge fan of desserts - we make a trifle called Death by Chocolate that involves brownies, pudding, whipped cream, toffee, and a big spoon. It's a favorite. I'll pick it, but you just rest assured that I love it all. And I eat it. Elizabeth is my bestie, and she's the bestest bestie ever! We met in high school, in theatre, and she has literally carried me through my toughest times. I'm thankful that she puts up with me every day! I really, really, really do love doing tax returns. It doesn't get a lot weirder than that! This is a lot like the food question for me. There are very few types of music I don't like! Typically in my car I will be playing the local country station or the Christian station, unless I know it's just going to be me for a while! I will blast Tori Amos (specifically the Little Earthquakes album), Robert Bradley's Blackwater Surprise, a whole mix of random. No favorites here. Night. Night nightnightnightnight! I HATE the morning. I hate my alarm clock. I hate getting up. I hate to get up knowing I forgot to set the coffee pot, so I can't even go downstairs and immediately pour a cup of life blood. But I love the calm of the night. I love it when I know that my kids are tucked into bed, and my hubby is sprawled across the couch, and all is safe and well in my little world. Night. Did I say night? So, there's my answers! Can't wait to read yours- here, at Mama M's, or on YOUR blog! Dude! I want your trifle!!!! Like now! I agree with Carebear..a trifle recipe post! Aww you are my bestie best too! :) I'm glad you put up with ME everyday. Funny blog! Now make me some pumpkin enchiladas. You sound like me as far as the alarm clock and anything else that wakes me up in the morning. I don't function well early.